Accessories. If you are concerned about adding too much color to an outfit,buy some accessories with bright colors. Belts: J Crew has skinny belts in a variety of bright colors for $34.50. Jewelry: Banana Republic has colored bangles for $19.50. Piperlime has a colored Sabine stretch bracelet for $24.00, a Tinley Road green stone circle ring for $16, a blue Kate Spade treasure chest ring for $78.00, and Kate Spade posey park pink stud earrings for $58.00. Nordstrom has Tasha ornate linear statement earrings (in a variety of colors)for $58.00, Nordstrom lapis of luxury frontal necklace for $68.00, Kate Spade solarium bib statement necklace for $348.00, and a Tory Birch orange logo pendant necklace for $145.00. Shoes. Piperlime has Tommy Hilfiger blue and green strappy sandals for $78.00. 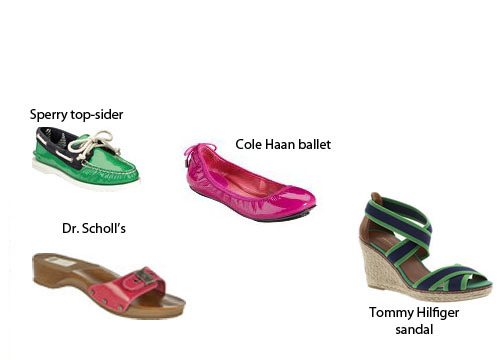 Shoebuy.com has the classic Dr. Scholls in a variety of colors for $65.95 and Sperry patent leather top-sider in red and green for $83.95. Cole Haan has the Air Bacara Ballet flat in a variety of colors for $148.00. Handbags. J Crew has a lot of bags with color. The Edie purse for $238.00, the Margate purse for $198.00, and the Havana clutch for $88.00 are three examples that come in a few different colors. 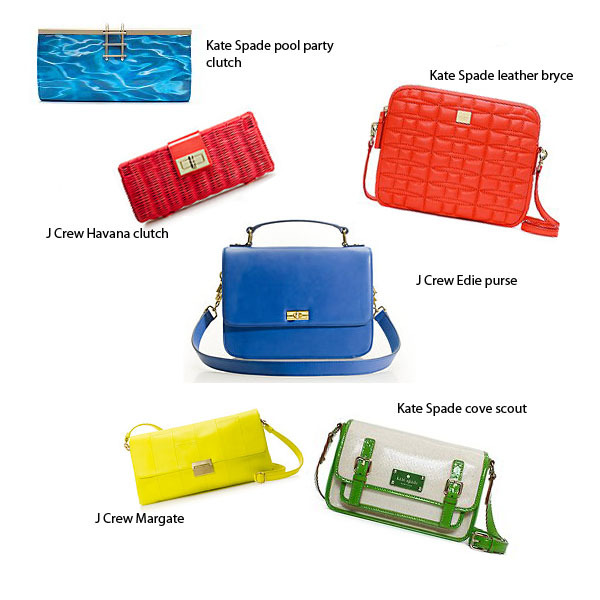 Kate Spade also has a variety including the signature spade leather Bryce for $248.00, the horseshoe cove scout with just a touch of color for $278.00, and my favorite the pool party clutch for $278.00.